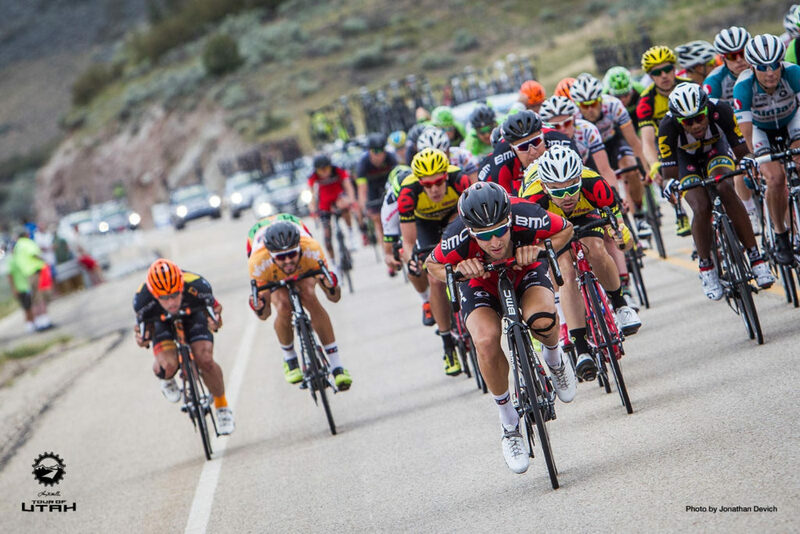 ST. GEORGE — The Tour of Utah, now in its 12th year, is grabbing a little piece of Zion in 2016. For the first time, the men’s cycling event dubbed “America’s toughest stage race,” will include a bracing jaunt through Zion National Park. The race, which kicks off Monday morning with the first stage, features some of the top cycling teams in the world. And those racers will have to contend with the switchbacks, steep hills, tunnels and majestic vistas of Zion. “I’m looking forward to coming back to the Tour of Utah and hopefully successfully defending my title. It’s a beautiful state and a beautiful race, and I have fond memories there,” said Joe Dombrowski, last year’s Tour of Utah champion. Stage 1 begins at Zion Canyon Village and winds its way through the park, including up the switchbacks and through the Zion-Mt. Carmel Tunnel before the peloton exits through Zion National Park’s east gate. The racers then continue on Highway 9 to Mt. Carmel Junction, then head north in State Route 89, eventually taking SR 14 through Duck Creek, Cedar Canyon and then concluding with a Cedar City finish line. The 84-mile stage includes 6,679 feet of total elevation gain for the competitors and begins at 7:55 a.m. It is the first of seven stages, with the eventual winner being crowned Sunday, Aug. 7 in Park City. 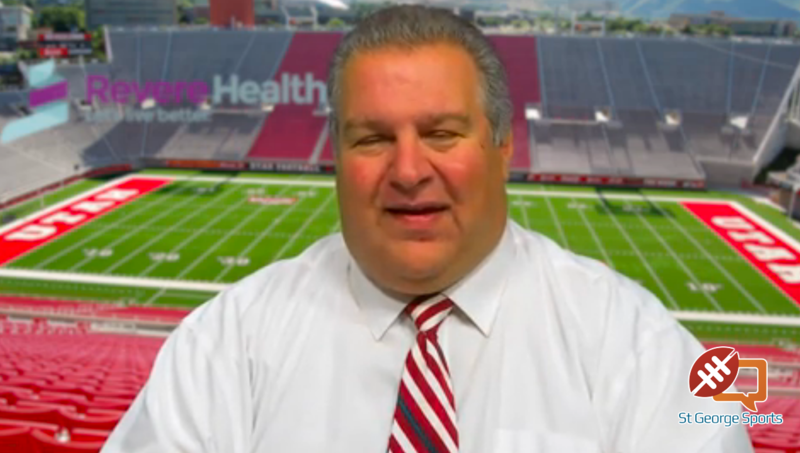 There are several things to be aware of for Southern Utahns. First of all, Zion National Park will, in fact, stay open Monday morning. However, shuttle service will be suspended briefly as the cyclists begin, and State Route 9 within the park will be closed to automobiles as needed to accommodate the race. 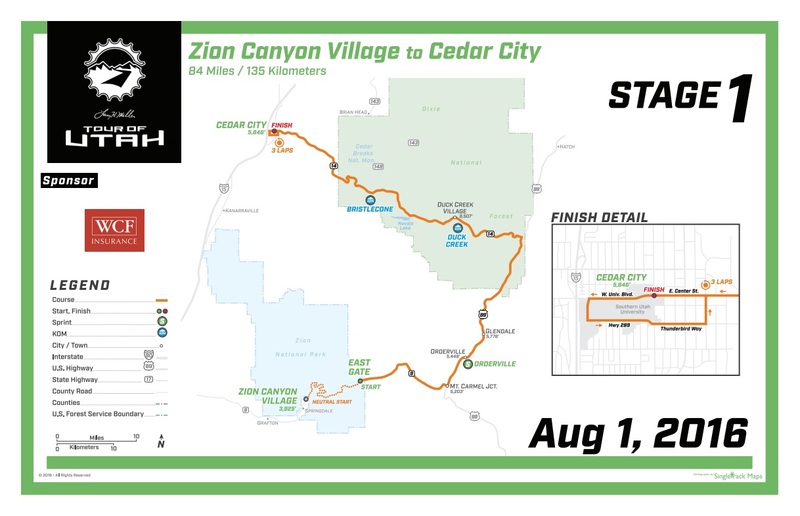 Spectators are welcome at Zion Canyon Village for the race start and the Zion Canyon Theatre will air Stage 1 on its giant IMAX screen free of charge. Due to safety concerns, spectator and staging areas are not allowed inside the park. Some accommodations have been made for people wishing to cheer on the cyclists. A section of State Route 9 from Zion Canyon Village to the intersection of Floor of the Valley Road will be closed to all traffic from 7:50 to 8:15 a.m. Motorists should be through the South Gate of Zion National Park before 7:45 a.m. Allow time for access at this area to the park. The South Gate to the park is expected to reopen by 8:15 a.m. The Springdale Line shuttle service will be paused at 7:50 a.m. and will resume routine service as soon as the South Gate to the park is reopened. The Zion Canyon Line shuttle service and Pedestrian entrance will remain open throughout the morning. First, organizers encourage people to come to the event by bicycle; start in Rockville (five miles to the start) or Virgin (13 miles to the start). Southern Utah Bicycle Alliance reminds riders that parking is restricted along State Route 9 in front of the residences in Rockville. Use lights and high-visibility gear and plan to arrive at Zion Canyon Village around 7 a.m.
Second, once in Springdale, use Southern Utah Bicycle Alliance’s bike valet. Follow the “Bike Valet” signs to the race venue — safe and secure bike parking from 7 a.m. to noon. Third, take the bus. A shuttle bus is available to take cycling fans to watch the start of the race. The bus begins loading at 5:30 a.m. at Dixie High in St. George and will make a pick-up stop at Hurricane High at 6:15 a.m. before reaching its final destination in Springdale. The shuttle will begin its return trip around noon at the conclusion of the stage. It is $10 per person. The deadline to get on the bus is Sunday, with 50 percent of proceeds going to the Southern Utah Bicycle Alliance and 50 percent to the Zion National Park Foundation. To get a seat on the bus: Follow this link. Lewis said bringing the Tour of Utah to Springdale “creates a powerful visual connection” for two of the key elements in the area’s brand as a destination. “What better image can you have to solidify our active/adventure brand than seeing world’s best cyclists competing in the grandeur of Zion National Park,” he said. After the 20-mile descent down Cedar Canyon, racers will complete three laps around SUU for spectators to enjoy. A fast sprint to the finish is expected to take place around 11:30 a.m. Monday with the finish-line located in front of the new Beverley Taylor Sorenson Center for the Arts at the corner of University Blvd and 300 West in Cedar City. The race, officially the Larry H. Miller Tour of Utah, winds 705 miles through the Beehive State. Sixteen teams, with 122 athletes representing 26 countries, will compete in this year’s race. Five of those teams completed this year’s Tour de France. The Larry H. Miller Tour of Utah continues to be free to all spectators. It is the first internationally-sanctioned cycling competition in North America following the Tour de France. Fans can watch the race on Fox Sports 2 (ROOT Sports) and there will be a nightly recap show on KJZZ-14 at 8 p.m. Results can be tracked at http://tourtracker.tourofutah.com/. For more information about the Tour of Utah, visit www.tourofutah.com. It’s unfortunate that the will of the Springdale leaders and many, if not most, citizens were ignored in the decision to have this race. With county, state and national Utah leaders pushing for it, it was bound to happen but with many of these same folks waving the “local government” banner for decision making there’s more than a little irony in this decision. As for the Tour having a shuttle, that’s at least one good thing, but to charge $10 per head when the Tour’s namesake L.H. Miller has deep pockets and could have picked up the cost and donated to the intended recipients of the ticket money that would have been received, this too seems to be less than they could have done to make up for foisting this event that, according to Tour supporters, has so much value for the area.